MEMBERS of the public are being asked to donate time and money so architects in Dundee can rebuild the city’s historic Royal Arch - out of cardboard. The group aim to raise £2,270 so the figure can be built during the Festival of Architecture in May this year. This figure was identical to the amount raised by public subscription in 1849 for the construction of the original Victorian arch. Participants will be invited to help construct the cardboard tower under guidance from Claire Dow, an events producer in Dundee, and French artist Olivier Grossetete, famous for constructing People’s Towers in London and Sydney. At present, the group has raised £280 in nine days, and will reward donors with a support badge, a Polaroid selfie with the arch after the event or a signed copy of Grossetete’s architectural plans. Claire Dow said: “It’s a straightforward project in a lot of ways – we work with UZ Arts who are the UK producers and have done it before. Olivier does all the preparation, engineering and design work and supplies the boxes flatpacked to Dundee. “All we need to supply is a space to change those flat packed sheets into cardboard boxes (over 1,000 of them! ), a safe site and people – lots of people - to help build and topple our Royal Arch. Once the People’s Tower has been erected, visitors will be encouraged to take photos of the project and walk through the archway before it is brought crashing down the following day. 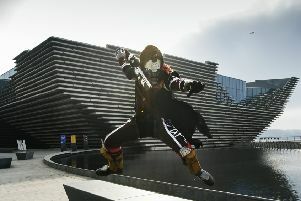 Provided enough funding is secured, the free event will take place over the weekend of 28-29 May in the city’s Slessor Gardens. Lord Provost Bob Duncan said: “The Royal Arch is an important part of our history. It is free to all and open to everyone willing to take part, with donations and information accepted on the group’s Indiegogo page. Claire said: “In the week leading up to the build event, there will be workshops and opportunities to make the basic cardboard blocks, which will have arrived in flat sheets to Dundee. The campaign is set to end on March 16, to tie in with the original demolition date of the arch on March 16, 1964.